Kiddush Lite. 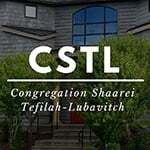 Rabbi Alter and Debbie Levitin are sponsoring cholent this week in honor of the Uncle Moshe and Aunt Ruti Weiss. Cholent will be made by Rabbi Mendy Levitin. Seuda Slishit Lite. Given by Aliza Tanenbaum, BCMH Yavneh Youth Building. Contact Aliza Tanenbaum if you are interested. This week’s Torah reading begins: “These are the offspring of Isaac,” referring to Jacob and Esau. Isaac was a completely righteous man. Early in his life, he was prepared to be offered as a sacrifice to G‑d on Mt. Moriah and even afterwards, when a ram was offered in his place, he was still considered holy, like a sacrifice. For that reason, unlike the other Patriarchs, G‑d did not let him leave Israel. He was holy and had to live in a holy land. One of his sons, Jacob, emulated his holi-ness. He was “a dweller of tents,” choosing to frequent the prominent houses of study of the age. But his other son, Esau, was a hunter, a man of violence and passion. And yet Isaac loved Esau. Some say Esau was able to deceive him. In Isaac’s presence, he appeared holy and then afterwards, he did what he wanted. But that makes our Patriarch look some-what shallow. Moreover, it runs contrary to one of the basic themes of Isaac’s life work. Isaac was a digger of wells. What’s the secret of a well-digger? Not to accept what you see on the surface, but to dig deep down, to keep clearing away the dirt until he finds the water of life. Isaac did that not only with wells, but with every experience in his life. He would probe to the depths and appreciate the in-ner core. Now if he did that with every-thing, wouldn’t he do that with his own son? So if Esau wasn’t fooling him, why did he love him? For precisely that reason. When digging deeply, it depends how deep you dig. If you dig past the surface, you will be able to see a person’s passions and drives — not all of that is pleasant. But if you really love a person, you won’t stop there. You’ll dig deeper until you find the essential core of G‑dliness that person has. For every person’s soul is an actual part of G‑d. In some, it shines openly. In others, it’s hid-den and in certain people, it’s very hidden. Since Isaac loved Esau, he didn’t look at his less favorable dimensions; he focused on the good that was deep inside of him. That also enables us to understand why he wanted to give the blessings to him. Isaac was constantly struggling to motivate Esau to live up to his spiritual potential. He felt that by pouring so much positive energy into him, he could arouse the good inside and enable it to dominate his personality. In fact, however, the blessings were given to Jacob. For the work of revealing the good in Esau could not be accomplished in a brief period of time. That indeed is the purpose of our efforts throughout the spir-itual history of the world, including this final exile, referred to as the “the exile of Edom,” another name of Esau. We are striving to reveal this spiritual energy, the “sparks” invested in worldly experience which is associated with Esau. The final consummation of these efforts will come in the Era of the Redemption. The powerful spiritual energies which Esau possesses will surface and be given appropriate expression. At present, alt-hough we are aware how our Divine ser-vice refines the material realm, the fruits of those efforts are not visibly evident. In the Future, “the glory of G‑d will be revealed and all flesh will see”; the positive effects of the thousands of years of effort mankind has dedicated to the refinement of material existence will be apparent. Although it is in the Future when this Di-vine service will reach complete expres-sion, we have the potential to experience a foretaste of that Future era at present: to look at every entity as it exists above the fluctuations of time, in its true and perfect state. This perception serves as a guiding light, inspiring and directing us in our task of refinement and hastening the coming of the age when this spiritual reality will be fully manifest in our material world with the coming of Mashiach.